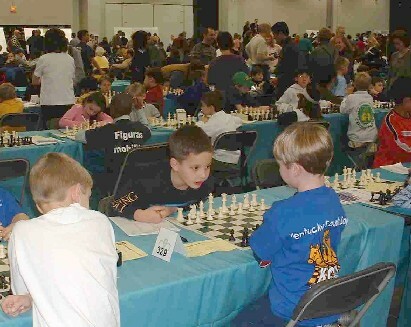 In December 12-14, 2003 our students, winners of NJ K-12 Scholastic Championships in different sections Arik Milner, Aviv Milner, Dina Shimanovich and Esther Shimanovich participated in 2003 National Scholastic K-12 Championships in Rosemont, Illinois. They played in the National tournament for the first time and demonstrated good results. Below please see two very nice games of our students. One of them is the game of Arik Milner played in the 4th round where he found bright checkmate combination by sacrifying the Queen. Another game was played by Dina Shimanovich. Before the beginning of the Championship, Dina together with many other young chessplayers participated in simultaneous game vs. Women World Champion of 1996-1998 Zsuzsa (Susan) Polgar. Dina successfully opposed to Women World Champion all the game, and lost only at 37th move when she missed the real chance to equalize the position. To use this applet, simply make a selection from the list shown below. A new window displaying a chess board should appear. Use the provided buttons to play or re-play each move.